H has been very supportive of LAIC, and I was away this weekend, so H offered to write a guest post! Keep in mind that I had the camera, so all pictures were taken via his Iphone. 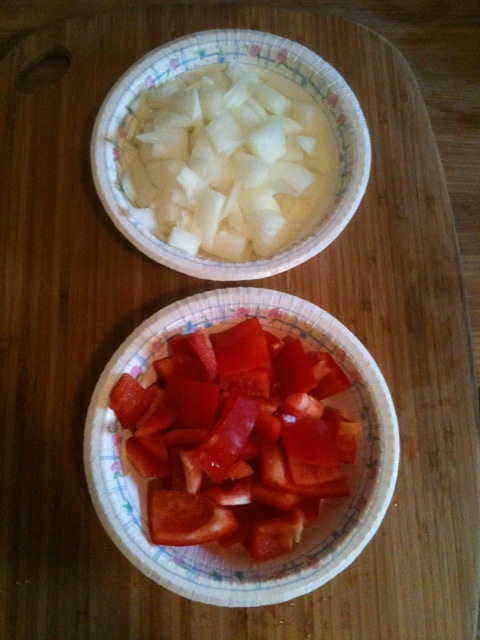 R was on a girls’ trip this weekend, so I was doing the chopping. After a long car ride home, I figured she would want a hot, tasty meal, and even to sit at the table (I prefer eating at the coffee table). 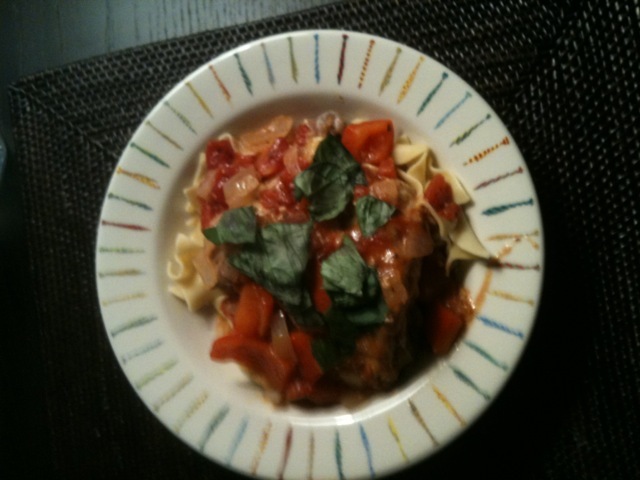 I like Italian food, but R asked for something healthy, so I decided chicken cacciatore would be a good choice. 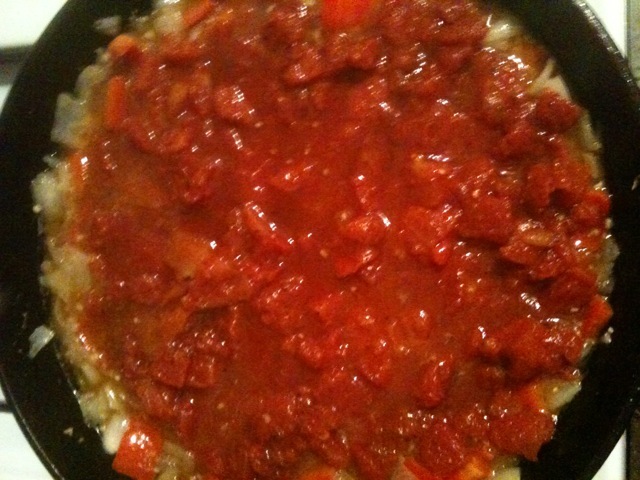 This is a dish that I have made before, but always forget what kind of canned tomatoes to use (diced, crushed, whole, stewed), so I did a quick Google and found this recipe from Giada. ” Sprinkle the chicken pieces with 1 teaspoon of each salt and pepper. 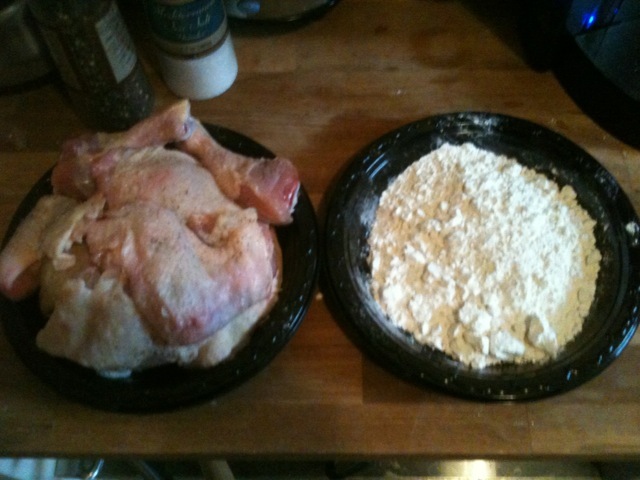 Dredge the chicken pieces in the flour to coat lightly. I tend not to be a stickler for recipes, as long as I get what we’re trying to do. The local grocery store had everything I needed, but I decided to go with regular sodium chicken broth and left out the capers. I don’t like capers. I’ve made this recipe in both a slow cooker and on the stove, and like the way it comes out on the stove. 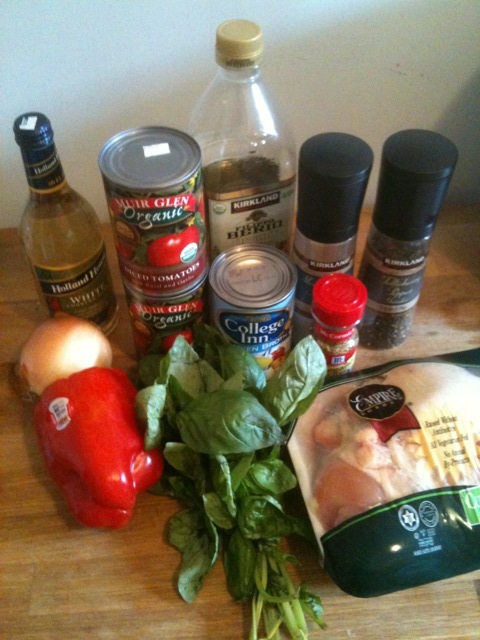 I’ve also used chicken breasts and whole chicken, and prefer the whole chicken approach. So this time, I purchased an Empire kosher chicken that was already cut into 8 pieces, and chopped the larger pieces into smaller ones. I also used my favorite cast iron skillet, which I bought with R on one of our first dates. (There was one time when it was accidentally washed with soap, but that’s a story for another day). The dish was served over egg noodles with a side of spinach. It came out well, though next time I think I’ll add some mushrooms to the sauce. This meal was DELICIOUS. Seasoned well and very tasty. A Sunday night treat and I definitely recommend it. Hope you liked H’s guest post. I think he had fun writing it, and will hopefully join us again soon. Enjoy! PS Day 2 of eating this dish (had leftovers for lunch), and I think Kosher chicken is the way to go. You can totally taste the difference.